CAPTAIN BLUE (Dan Trimmer) Tetraploid (Dress Blues x (Larry Grace Sdlg. from Tetra Lavender Blue Baby) 22" EM Re. 6" Ev. The pollen for CAPTAIN BLUE came from a dark purple self Larry Grace seedling, so when I bloomed a baby with a larger bluer eye and edge than Dress Blues I was surprised. Modestly branched and a reluctant pod setter two years ago, last year I easily loaded CAPTAIN BLUE with pods. From pollen I used the year before this year I’ve bloomed several large blue eyed offspring looking quite different from my smaller seedlings from other blue eyed conversions. The best of these CAPTAIN BLUE seedlings is a reddish based 6" flower with an even larger blue eye and edge out of Luddy Lambertson’s Awesome Artist. 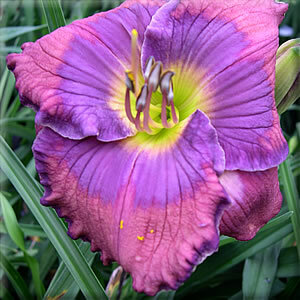 Since its first bloom CAPTAIN BLUE has been very admired and is in quite short supply.